You know what works for me? Not having to stop in the middle of a recipe to wash dishes. That's why I LOVE having a kajillion measuring spoons. I never have to worry about my set being in the dishwasher; there is always a set clean and waiting to be used. The funny thing is....I don't think I actually purchased ANY of these sets! 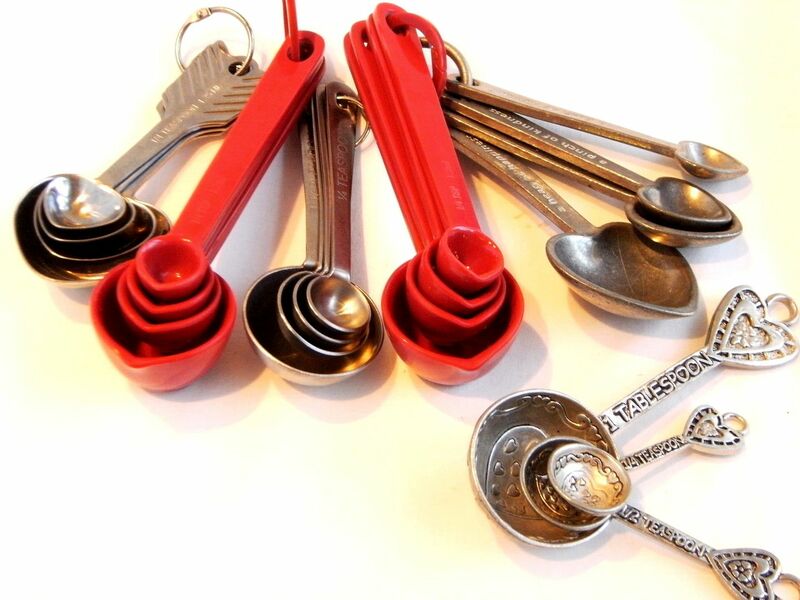 How many sets of measuring spoons do YOU own? I only have 3 sets and a smidgeon/pinch/dash set. But have my eye on a couple of more sets. Cups too. Same reason!!! I only have 2 sets and it's not enough! Have to have at least 4. Only one set, but i'm looking for a nice, metal set. Hard to find a set with 1/8 tsp. I'd also like to have the smidgen, pinch, and dash set! 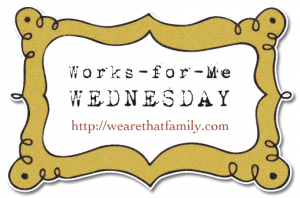 I have 5 sets of measuring spoons and love and use them all! I only have 2 sets. But the bad part is, I only found the second set today! 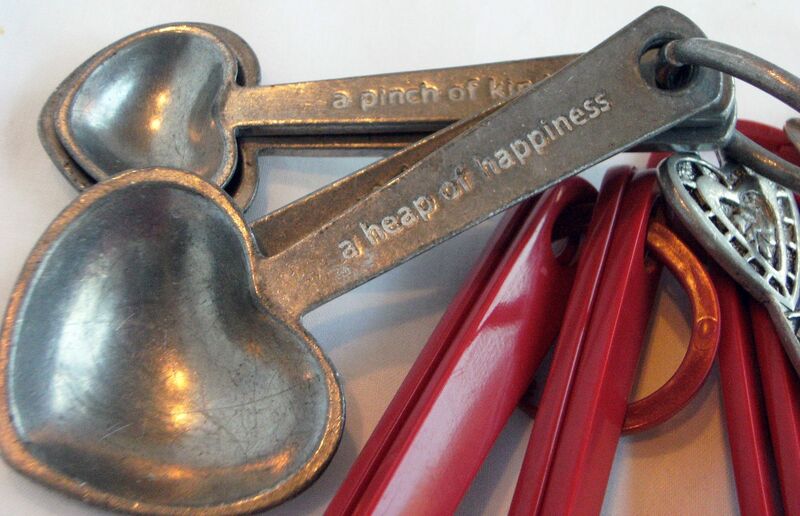 Adore the heart shaped measuring spoons - must have some asap! I love all of yours!! OMG, thought I was the only lazy baker I knew. I also have multiple sets of measuring cups. Works for me!!! Rosie's All-Butter Fresh Cream Sugar-Packed Baking Book by Judy Rosenberg. If they are close family friends they get a Kitchen Aid mixer, the books and the measuring spoons. I have three sets....but I don't measure very often. blush. I have four in sets and a few extras floating around that I detached. Oh, I love hearing things like this and think "Glad I'm not the only one!" I have 3 sets of spoons and at least 4 not-so-complete sets of cups. The 1 cups are in my powdered sugar, granulated sugar and flour! I'm the same way and have a few sets. My most used one is the multiples set. I have a recipe I always double so the two teaspoon spoon is awesome for that. I also use my 1 1/2 tablespoons spoon twice for tablespoons. Love it! I agree totally!! Such a pain to have to stop and wash stuff out. I love your heart spoons!! 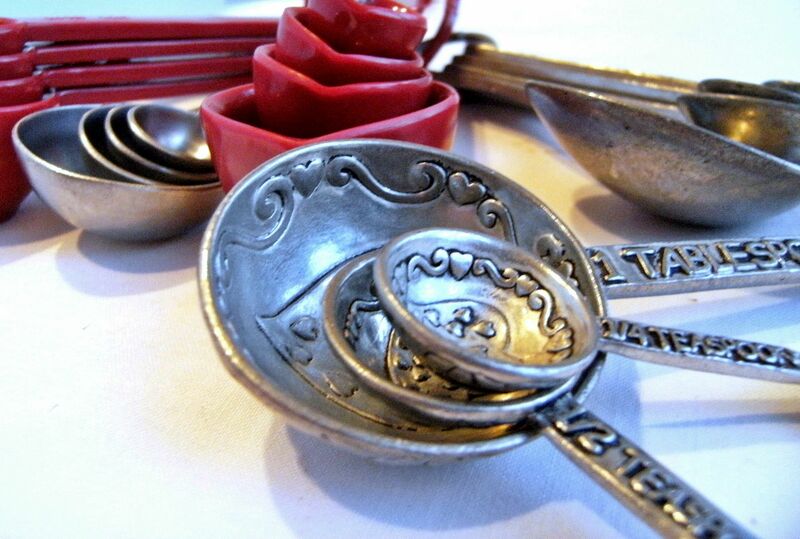 Only YOU...sweet~lovely Bridget would have that many sets of HEART shaped measuring spoons! This is why I adore you!!!! I have one really good set of measuring spoons. And then I have some loose ones. Two of which are old old...that my mom use to use! And the other day I got a package. It was from a friend...she sent me a set of colorful flower shaped spoons. Everything about YOU is just so SPECIAL Bridget! Which is WHY I just subscribed to Bake @350! Now you will be delivered to me by EMAIL! Yeah! Can't wait to have Bake @350 come through email! I have three sets, but I have my eye on two others...and sometimes I end up using all three sets when cooking & baking up a storm. It's like confession about measuring spoon-aholics. I luv it! i dont like having to do dishes while baking either! i have 3 sets, but one of them is missing a few spoons. Stands to reason that someone who makes such cute cookies would have such cute utensils! I have multiples of measuring spoons and cups but none of them were gifts and certainly none of them are as cute as yours. Embarrassed to say I also have 10 or more rubber spatulas, I use them while baking and cooking. I can use them all up in one baking or cooking storm. I have 5 sets of measuring cups and 8 or 9 measuring spoons. I can't stand running out when I'm in the middle of a big baking or cooking project. I only have one and I'm suddenly wondering how I've been able to function in the kitchen! I am definitely seeing the brilliance of have multiples. I only have three sets, but you have totally inspired me to get more. I am totally that way about spatulas. I think I have 8 or 9 of them and still always looking for more. I told my husband not to bother with a bouquet of flowers, I want a bouquet of pretty spatulas!! Just bought my 3rd set, after a couple of my 2nd set fell victim to the garbage disposal...but measuraing cups...I'm never short on those! FYI - love the long rectangle spoons - they fit in jars! Love this tip! I have 4 sets- but none of them are as cute as yours. I currently only have 2 sets but feel the need for a 3rd set. I'd love to have a cute heart-shaped set like yours. I also have 2 sets of measuring cups & could probably use a 3rd. I also have other measuring cups in various sizes - 2, 4, 6, and 8 cups. Love all of them. Off the top of my head, I have 5 or 6 sets. Same for cups too! I have 6 sets that I can think of, some are from cooking parties my daughter went to. I have found some really really cute ones at Anthropologie! I love my stainless steel ones the best. Although I do love your heart ones. Zero, believe it or not. I don't know why, I've just never bought any or had any bought for me! I use regular old spoons from the drawer, and they work for me! I have two sets of spoons and two sets of cups. But I am always looking for spoons, so I think you've just enabled me to buy some more. I think two more sets would be just about perfect. I don't keep my sets attached, though. I remove the ring and just toss the pile in the drawer. No need to wash the whole set when I only used one spoon. Oh, I love your measuring spoons! I have 4 or 5 sets....but they are not that pretty. I think I have 2 sets. I like your heart set. I have one set, but I have never used it before. In the Netherlands we work with grams so I only use my measuring scale. I now ordered an cookbook in english so I can use them soon! I recently purchased three sets of Kitchen-Aid aqua blue spoons! I thought I was a weirdo for doing so but I knew it was practical for a baker like me. I only own one set of measuring cups and spoons because I live in Austria and we have the metric system here. For American recipes I use a measuring set my boyfriend gave to me after he had been to the US. I only it once for finding out how much I need, then I immediately weigh the ingredients with my ultracool lime green kitchen scale and note down how many grams, mililitres etc I need. That works better for me and I don't need to wash that many measuring cups the next time! I am just curious if you know where the heart shaped measuring spoons on the far right in the top picture were purchased. They have the sayings on them "a heap of happiness"
Hey Hannah! I'm so sorry...I'm not sure. They were a gift.